OSTEOproSPINE is a innovative science project funded through the EU Framework Programme for Research and Innovation – HORIZON 2020. The overall vision of OSTEOproSPINE is to provide a long-term solution for the treatment of degenerative spine disorder through a personalised bone implant. 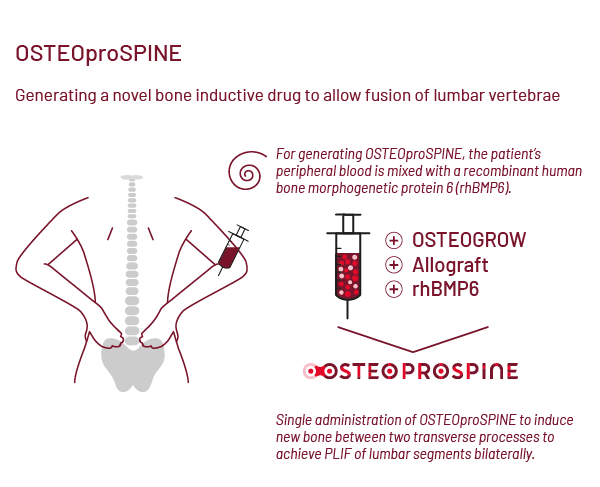 Utilising the research results of the former H2020 project OSTEOGROW, OSTEOproSPINE will be setting new pathways for the innovation in spinal surgery for the benefits of millions of patients worldwide. Besides the University of Zagreb School of Medicine as a coordinating institution, the project encompases 11 partners from 5 European countries: Croatia (Genera Research d.o.o., Smart Medico d.o.o., Triadelta partners Ltd, University of Zagreb Faculty of Veterinary Medicine); Austria (University of Vienna School of Medicine, Kepler University Hospital Linz, Medical University of Graz i Quality By Experts GmbH); Slovenia (Clinres Farmacija d.o.o. ); Poland (2KMM Sp) and Germany (Eurice European Research and Project Office GmbH – Eurice).